Another week and another action-packed episode of Pretty Little Liars. There's a lot to cover and, unfortunately, despite the heartbreaks, the blackmail, and one very drunk Spencer, we still didn't get much closer to solving any of the show's mysteries. "Breaking the Code" provided some really big pieces of evidence, but did any really lead anywhere? Jonah only gives Aria and Spencer an address attached to an old burn phone used to text Alison. When the girls investigate the house, they just find a bunch of mail and an old man staying in the abandoned home. At least we got something," Aria said, but I couldn't help but think: VERY little. It was pretty frustrating until Hanna (strangely enough!) started investigating the name of the law firm on the mail. Her mother revealed that Melissa used to work as an intern at that firm until it closed down. After watching the video Caleb sent to Hanna, all signs point to Melissa for the girls. But Spencer isn't ready to accept that. In the past, I've really hated the way she rigidly applies their "rules" to everyone else but makes special exceptions for herself. She's also quick to judge any new suspect rather harshly. However, this time I can totally sympathize with her position. Spencer has had to deal with a lot of revelations and it couldn't have been easy to watch her sister blow her off for creepy stalker Garrett. The whole thing was made worse by Wren's comment that Garrett accompanied Melissa to her last doctor's appointment. Speaking of Wren, I thought it was nice of him not to take advantage of a hilariously (and embarrassingly) drunk Spencer. Spencer shouldn't have been so reckless as to try and solve her problems with alcohol. Plus, hooking up with Wren is not the best idea, especially when she's adamant about protecting others from A. Not to mention the fact that she seems to have forgotten about Toby pretty quickly... even though she just mentioned how devastated she was to lose him. Is it really so awful to be single for a little while? So, what's Melissa's role in all of this? She's finally going to talk to her sister, but do we really expect her to come clean? I think, given her relationship with Ian, Melissa probably had a violent confrontation with Alison the night of her death, but doesn't want anyone to assume she killed her. But I'm sure there's a lot more to it. Also, I guess it makes sense that A is starting to threaten people other than the titular liars. 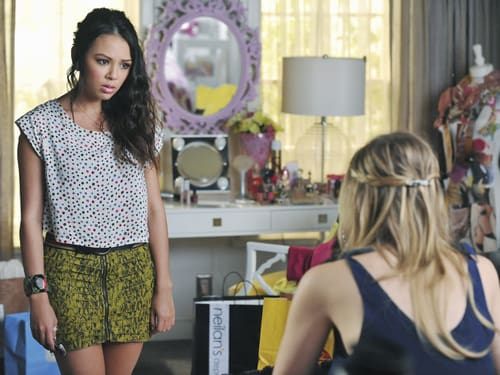 Mona seems like an easy target, but I was impressed by her loyalty to Hanna. She's always a much better friend to Hanna than Hanna ever is to her. Maybe that will change now that she's one of A's targets. It was good to see the girls welcome Mona to their table and their daily drama. Who else might be on A's contact list? Or maybe... Mona is working with A and this is part of an elaborate plan to take down the group from the inside??? It would be a pretty smart move and we already know how clever Mona really is. Regardless, we already know that A is causing trouble for people other than Hanna, Aria, Emily and Spencer. Now A is starting to make parents like Ella and Ashley very suspicious. How long will the girls be able to keep their "A problem" a secret? Emily spent most of the episode moping over her fight with Maya. I do applaud Emily for avoiding jumping into another relationship with Paige. She's been bouncing from girl to girl since she came out of the closet and it was good that she realized (unlike Spencer) that making out with a new person wasn't going to help her problem. BUT the big question is: Qhat happened to Maya? Did she just run away or did something worse go down? Finally, Ezra's seriously considering that job in Louisiana, which led to Aria's total breakdown. Her little tantrum about the loss of her secret boyfriend was understandable, but unfair to Ella. And, I couldn't help but notice how detached Ezra seemed when he suggested he and Aria face the truth. He drove away while watching her cry and didn't seem very affected by it. Did Ezra find something in Louisiana he wants more than Aria?